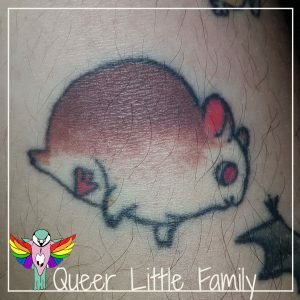 People often ask me how many tattoos I have and at the current count (as of 09/06/18) I have…a lot. Twenty-two. Though at some point my leg will be one big tattoo; do I count it as one? Is it lots a little ones with a background? Does anyone care? 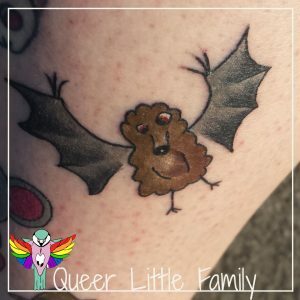 Anyway, here are all my tattoos, their stories (should they have one) and why I get them. Couple of quick notes – Some of these pics are the old pics. Some are new. It’s obviously image-heavy. You can also see some of my self-harm scars. I got my first tattoo at nineteen. I still had a huge phobia of needles back then but I liked next door to the coolest person I’d ever met and she had tons of tattoos. I wanted to be cool too, and I wanted a tattoo. But, much like for my Meningitis Vaccination, I had to be ‘escorted’ to the tattoo parlour. I still almost did a runner even after I picked out a design; a little sun that I wanted to be coloured in yellow. I don’t regret it. Not the tattoo itself or the fact that I had to be heavily convinced to get it done. I don’t remember it hurting that much, to be honest, and at this point, I had already started to self-harm off and on, so how much different want it really. When my mum saw it after picking my sister up after she’d stayed with me for a week she tried to give it a ‘mum wash’. She licked her thumb and tried to wipe it off. I still laugh thinking about it. I’m a little fuzzy on the timeline of the next three. I’m pretty sure I got the four stars on my wrist second. 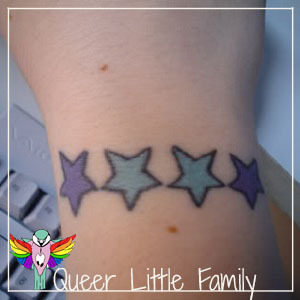 I am often asked why I didn’t alternate the stars so I could wrap them around my wrist but I never wanted something like that. The two purple stars flanking the blue stars represent family to me. 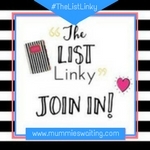 My sister and I loved and protected by two people – my cousins, my aunts, my mum and stepparent. I got the black sun because it felt like a good representation of my life with depression at that point. I got it half filled in at a later date. 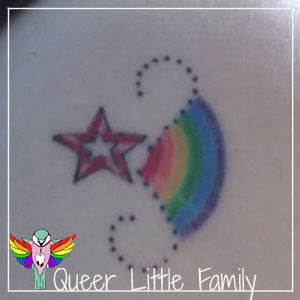 The star and rainbow on my shoulder blade I got around the same time. 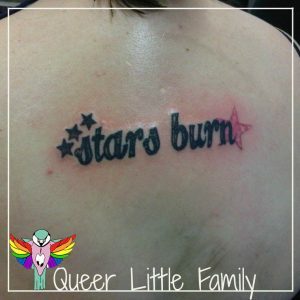 I was definitely aware of my queerness at this point, I’ve always liked stars, I liked this design so why not. Like was pretty bleak at that point, and mostly I remember having not eaten before the tattoo and almost passing out while getting it. I always hit up a Mars bar before a tattoo now. 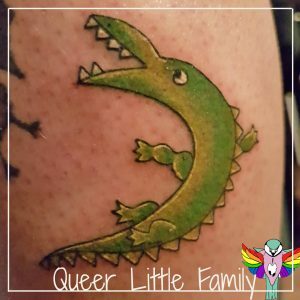 Just before I moved back to Wales, and not long after, I got a tattoo for my nephew and one for my niece. The balloon heart I designed myself -a nod to a poem I wrote about my nephew. He was an still is my world. Even if he’s fifteen and a pain in the arse. 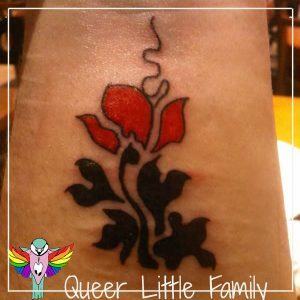 After my niece was born I found the poppy online and got that done on the other wrist. The inside of the wrists hurt a lot. The skin is really thin over the veins and so the tip of the poppy hurt a lot more than the rest. All of the heart hurt. I consider getting it touched up sometimes because it didn’t heal well. Around the same time, actually, possibly before I got my poppy done I went to the dodgy parlour at the bottom of the hill in Aberystwyth. This was just before my current tattooist had opened up, and I didn’t know any better. Or have many options really. I got these two done at the same time. 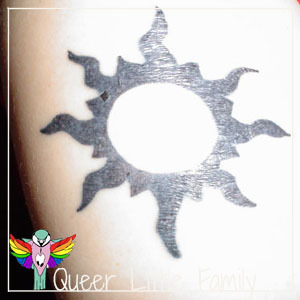 The pride flag is only in half the sun because I’m bisexual, and the star was because I really freaking like stars (see above). No regrets, except that I got them done at West Coast really. My biggest tattoo is only one of two I can’t see. I was never big on getting them in places I couldn’t see them but I kinda like the idea of getting this on my back so I went for it. I wrote a poem, called Stars Burn, that has stayed with me after all these years. So much so I got it tattooed on my back. It was done by Alex at Monster Ink, his second tattoo for me after I got the poppy done. I got the little TV/Heart done around the same time cause I’m a huge geek. I am currently in the process of getting a half leg done. It started innocently enough; one day my wife drew Nandy Bear on my leg with a biro. 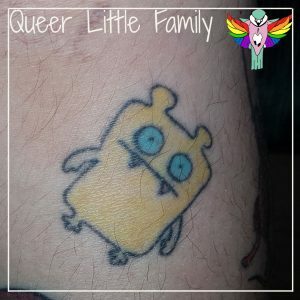 And being the kinda person who likes Nandy Bear (I bought one on our first trip to the US, in New York) and tattoos, I had it tattooed. Then I started adding to it. A hamster because I’m the hamster whisperer (we owned eight at one point), a vampire hedgehog Bethend drew on some tissue paper she used as wrapping paper for my birthday present one year. I drew Choo-Choo myself; he’s my childhood toy (I still have him). 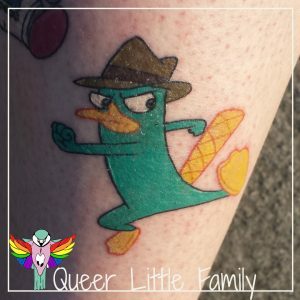 Perry and Lion followed; Phineas and Ferb is one of my favourite shows and Steven Universe is life. Seriously, if you’re not watching Steven Universe how can you be living your best life… I got the Penguin from a website that I now can’t find (with permission) as they’re my favourite animal. The nug is from Dragon Age; one of my favourite game series. 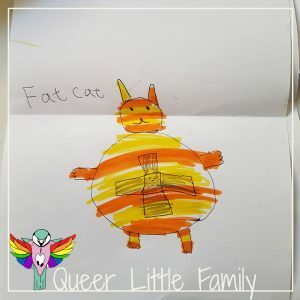 I had my niece draw me some animals for me and one of the ones she drew was the fat cat. It’s one of bethend’s favourite stories (and the subject of her own ongoing tattoo project). On top of that, after her accident in 2015, she struggled with her memory and speech but could recite the entire story from memory without problems. I have the address for Earth’s Stargate down the calf of my left leg. For the record, the calf hurts a lot less than the shin. A LOT. I got this for a few reasons. I’m a massive geek at heart. Stargate, Star Trek, Star Wars…I could go on. Stargate SG-1 was pretty much one of the few reasons I am still alive, it’s the reason I got into fanfiction, the reason I realised I was bisexual (hello Amanda Tapping) and the reason I met my best friend of over ten years Melanie (and my son’s godmother). Still, Stargate makes me happy, I still dabble in fanfic for it, still watch it, still love it and want it to return. So I finally bit the bullet and despite my other leg being a work in progress I got the address done. 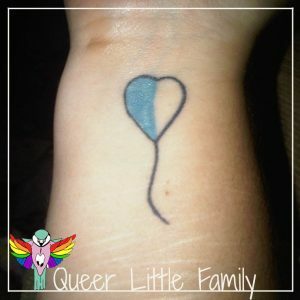 I definitely want some more pride flags on my body. 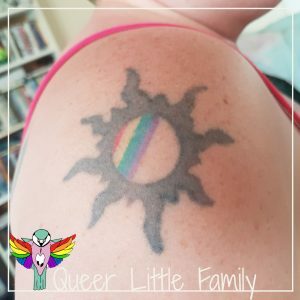 The bi, genderfluid and non-binary ones. I want more geeky tattoos for sure. And of course I want to finish my leg. 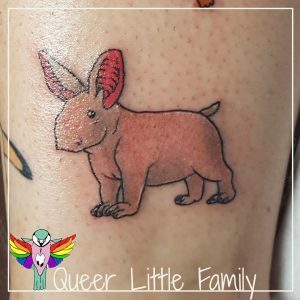 I have a folder of tattoo ideas – animals I want to add. Snoopy will definitely go on there, Snowy from TinTin, Cinos, a fat hedgehog I drew years ago maybe. I also want to get my son’s fingerprint (or maybe handprint) tattooed over my heart. I’m waiting until he’s a little older until I get that done. Mostly cause his fingerprint, of course, will be tiny right now and I don’t know how many more kids I’ll have. One more at least I hope. I will update as time goes on. My next tattoo isn’t until October because that’s how popular Monster Ink is. And if you have any questions about tattooing, hit me up. I’m not an expert mind, I just have a few now. 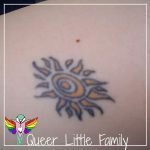 This was a really interesting post – always love hearing the stories of people’s tattoos. Also a fellow Steven Universe fan, yay! 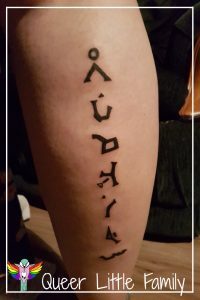 I think your Stargate tattoo might be my favourite, it’s really cool. I have a big back piece planned but with potential baby things in the work I’m not sure when I’ll have enough saved to make it happen. One day! Good luck with your next tattoos! Looking forward to seeing them. 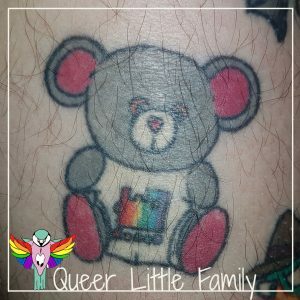 What a great selection of tattoos you have! I love that they all mean something special to you, I think that is the main point of one, to mean something or to retell a memory or point in time. I really love the fat cat tattoo. It must be so nice to have such a special memory to cherish and remember every time you look at it. I love that there is a story behind every one of your tattoos. 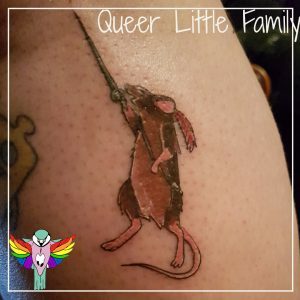 I love the animal tattoos. I love this post. I love real stories like this. I have only one tattoo which was done when I was 21. 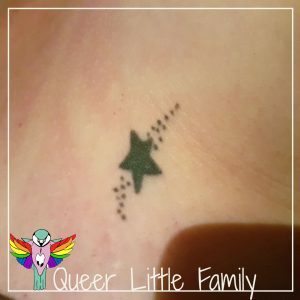 I may get another at some point – perhaps a tiny one with a seaside or nautical theme – but I’m seriously into natural health and I’ve never liked the idea that the ink particles get into the lymph nodes and permanently stain them. My friend got her Celtic triangle knot tattoo done at the same time as I got my Celtic circle knot, and later when she met her husband (of Greek heritage) in her late 20’s found that he had a Greek triangle tattoo…years later when they had some sandstone pillars installed at the entrance to their property, one was engraved with his Greek triangle tattoo and the other with her Celtic triangle knot tattoo! I have a few tattoos and the one that hurt the most was the back of my neck. I’ve not had one for a couple of years now and I would love to get more. 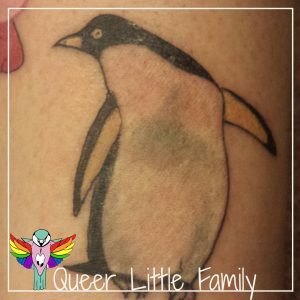 I really like your penguin tattoo! 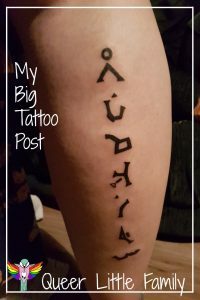 I love reading these kind of posts as I don’t have any tattoos and always like to know the story behind people’s art. What a fascinating read! 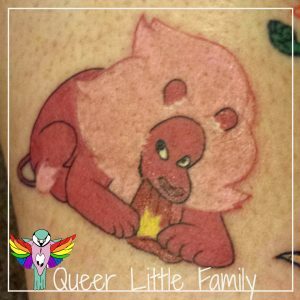 I found the one based on your niece’s drawing to be rather moving! You have a few and I love them, the collection and the stories behind them – the one your niece drew is my favourite though, so sweet! 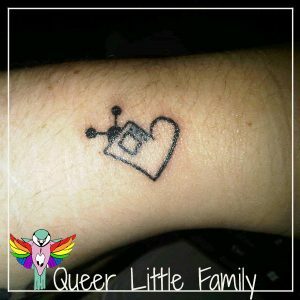 I love finding out about people’s tattoos and the reasons behind why they got them. 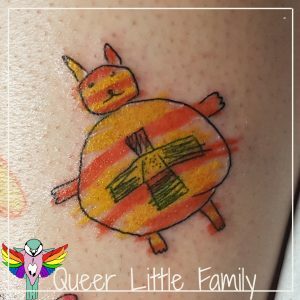 I think it is great that each one has a story behind it – I love that you got your niece’s drawing of Fat Cat tattooed on you, so lovely! Wow! That’s quite a collection. I have one. It’s old and faded now. I would really like to freshen it up and get my girls date’s of births added to it as well. Not sure I want to subject myself to the pain though. I’m quite a baby! I love that you had a drawing turned into a tatoo. That is awesome. 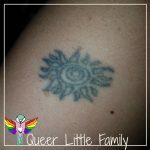 I often wondered the stories behind tatoos. 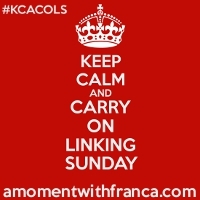 Thanks for linking up to #KCACOLS. Stop by next week.